Marattia (after Giovanni Maratti, 1723-1777, a Benedictine abbot) is a genus of 50 to 55 species native across much of the Southern Hemisphere. 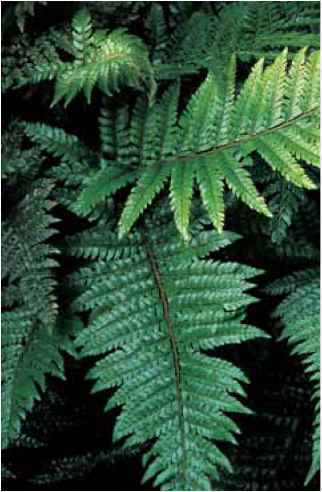 Marattia salicina (willowlike), while not a tree fern in structure, is a huge species from the South Sea Islands including New Zealand and Tahiti. The stipes alone are up to 3 ft. (90 cm) tall. They support 8- to 10-ft. (2.4- to 3-m) long, broad fans of glossy, bipinnate blades. Veins extend in symmetrical straight lines from the pinnae midribs to the margins where they are cinched by linear beads of fused sporangia which open in a lengthwise slit, rather like minute and stubby pea pods. The succulent and starchy rhizomes were once a popular food source for indigenous populations, but in New Zealand, at least, wild pigs have almost completely destroyed the native stands. The survivors are in nature preserves or on the slippery slopes of muddy hillsides. Wherever cultivated, and they are certainly recommended for imposing statements in Zones 9 and 10, they need a copious supply of water and protection from the wind to keep their extensive foliar structure hydrated and at its ornamental best. Give them deep shade and room for the roots to run in rich compost. 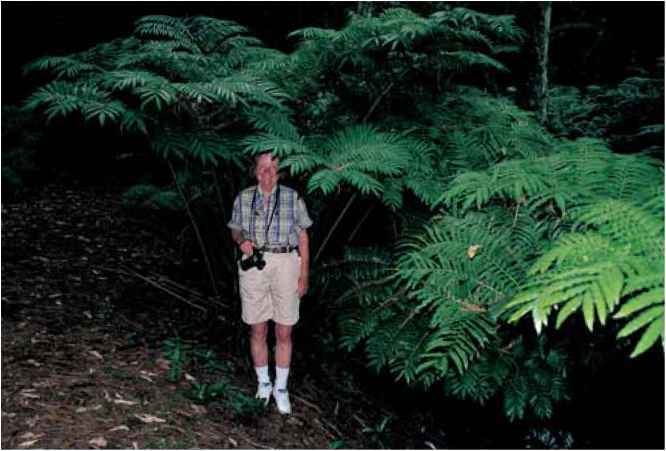 The author under an overstory of Marattia fronds in a New Zealand park. Photo by Harry Olsen.